In November 2007, Connie Woodhouse, Jeff Lukas, and several colleagues held a workshop in Albuquerque, NM as the first stage of a NOAA-funded project to expand and improve the usability of tree-ring reconstructions for drought planning and water management in the Rio Grande basin. Based on feedback from workshop participants, including staff from the New Mexico Interstate Stream Commission, Woodhouse, Lukas, and David Meko generated two reconstructions for the Rio Grande at Otowi gage. One is calibrated on gaged flows with adjustment by the Natural Resources Conservation Service (NRCS) for the San Juan/Chama diversion and evaporation and storage effects of two reservoirs, and the other is calibrated primarily on the sum of 10 headwaters and tributary gages largely unimpacted by diversions and depletions (see this presentation for details). These two reconstructions, along with one for the Canadian River in the Arkansas River basin, were presented at a follow-up workshop in Albuquerque in May 2008. Linear regression was used to calibrate the observed flow record with a single predictor, which was the simple average of 17 tree-ring chronologies from Colorado, northern New Mexico, and southeast Utah, that spanned the period 1450-2002. The residual chronologies, with the low-order autocorrelation removed, were used. Validation statistics were computed using a leave-one-out (cross-validation) approach. Figure 1. 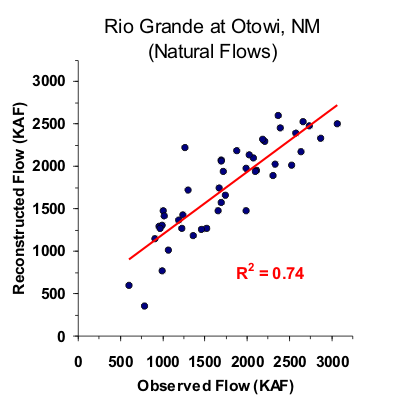 Scatter plot of observed and reconstructed Rio Grande annual flow, 1958-2002. Figure 2. Observed (black) and reconstructed (blue) Rio Grande annual flow, 1958-2002. The observed mean is illustrated by the dashed line. Figure 3. Reconstructed annual flow for the Rio Grande (1450-2002) is shown in blue. Observed flow is shown in gray and the long-term reconstructed mean is shown by the dashed line. Figure 4. The 10-year running mean (plotted on final year) of reconstructed Rio Grande flow, 1450-2002. Reconstructed values are shown in blue and observed values are shown in gray. The long-term reconstructed mean is shown by the dashed line.